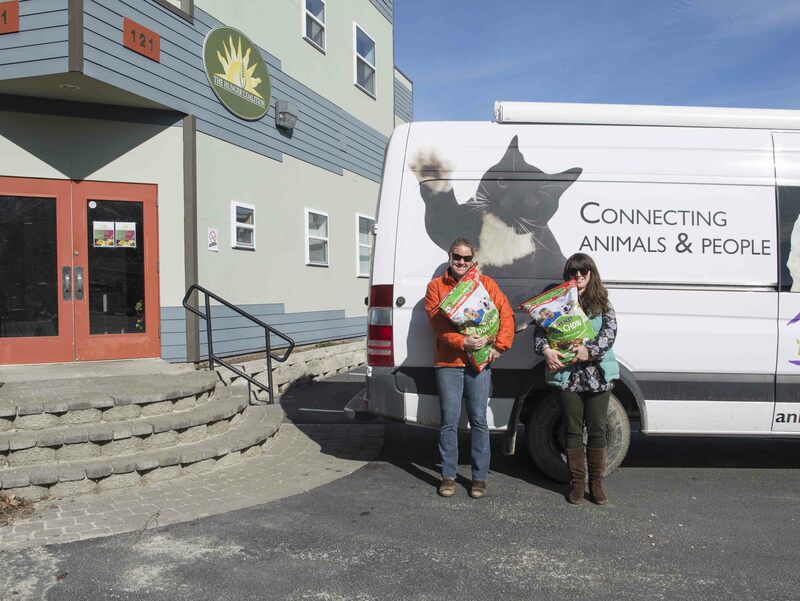 Paws for Hunger is Mountain Humane’s Pet Food Bank partnership with the Hunger Coalition. We raise funds to purchase the pet food that stocks the bank, and volunteers transport the food weekly to the Hunger Coalition warehouse. The Hunger Coalition distributes this food to families in need. Since 2010, 6,172 bags of food have been given to families within the Wood River Valley. That’s more than 77,500 pounds of food! Not only does providing pet food to families who are struggling financially help keep pets happily with the people who love them, it also opens the doors for people to ask for help themselves. If you, or someone you know, is in need of pet food assistance, click here for more information. Paws for Hunger es la asociación de banco de comidas para mascotas, que Mountain Humane tiene con el Hunger Coalition. Nosotros recaudamos fondos para comprar la comida que llena el banco y voluntarios la transportan cada semana al almacén del Hunger Coalition. El Hunger Coalition distribuye esta comida a familias necesitadas. Desde el 2010, 6,172 bolsas de comida an sido dadas a familias del Valle de Wood River. Eso es mas de 77,500 libras de comida! No solamente al proveer comida para familias que estan luchando financialmente mantiene a mascotas felizmente en sus hogares, si no que tambien abre puertas para que la gente pida ayuda para ellos.